There are several types of .bmp file. Umbrella.bmp has four bits per pixel. Each combination of four bits represents one of the 16 colours in the colour table. Only a few lines of code are required to change a colour. This program reads and outputs data from the header before seeking and changing one byte. That is all that is necessary to change the colour of every bright red pixel in the umbrella on the left to obtain the image on the right. BlockRead is a useful procedure for reading different data types from a file. Note that the file type to enable BlockRead is just file and not file of byte. 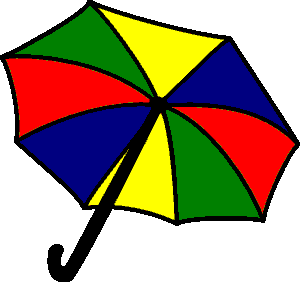 You need a copy of umbrella.bmp in your program folder. We obtained the original from Clker.com.